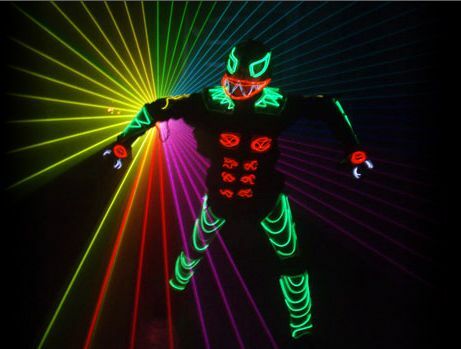 Team Tron is a unique performance group that combines electroluminescent costumes, dance and multimedia content to create a different show for each client. These fantastic entertainers are available to hire worldwide. 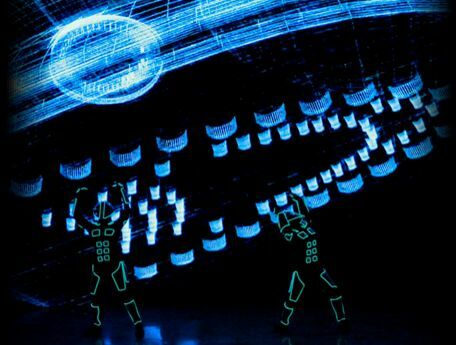 By employing LED and Laser technology Team Tron create a unique performance for every client, based around their theme, staging and projection requirements. This can range from completely redeveloped costumes, graphics, choreography and music to a simple slogan or logo insertion to an existing entertainment show. Team Tron are full of entertainment ideas and are great for corporate events if you are looking to really wow your guests. Team Tron also provides a service for costume design and logo construction as well as prop making. 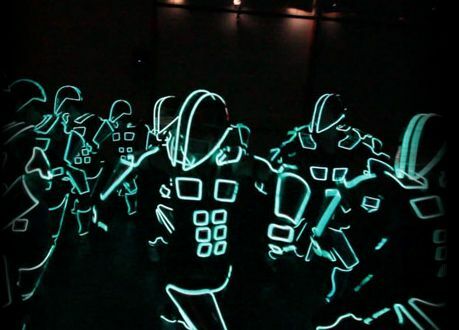 They can create a glow suit that fits perfectly the client’s idea for a specific event or campaign. The existing costumes can also be customized by adding logos or key features. 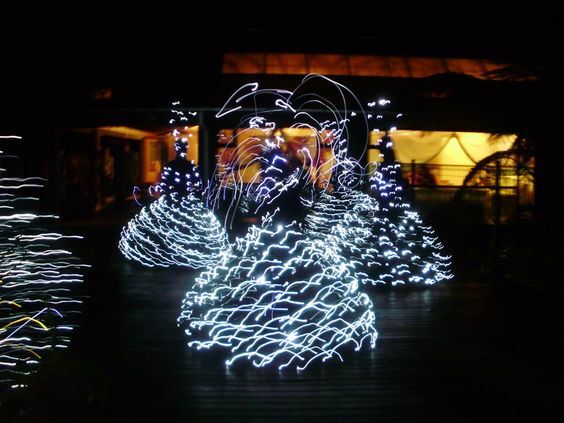 Team Tron are highly experienced in incorporating LED, Elwire and Laser technologies into durable costumes and sculptures. The costumes are self-powered and they do not need special lights to create their visual impact. We have developed our own wireless micro processor based computer link between costumes, graphics, sound and props. This gives our troupe the perfect timing required to create stunning shows. Blue Tron suits can change into different colors. Team Tron also employs a team of 3D artists, video compositors and editors that can design the client’s graphics for the show. The futuristic edge of their shows has delighted audiences around the world in countries such as Australia, Germany, Japan, Italy, Spain, New Zealand and Venezuela. The troupe has performed acts for international brands such as LG, Chevrolet, Vodafone, L’Oreal, Sony Ericsson, Intel, Microsoft, Ford, Telecom and Hyundai. The only absolute requirement for our shows is darkness. We have successfully performed high quality shows with only two dancers and without any technical requirements from our clients, though usually our clients wish to include graphics, more dancers and unique choreography that will create a spectacular show that exemplifies the best in the field of light performances. Based on experience, the technical requirements of our shows range in complexity from a simple dark space, to a multi-projector surround sound laser set-up. For our projections, we strongly recommend to our clients the usage of LED screens, as it adds to the wow factor of our optical illusions and enhances the power of the graphical content of the act. We still can present our shows with rear or front projection, and we do recommend Watchout when multiple projectors are being utilized. We happily assist our clients regarding the design of the stage and screen layouts. Please do not hesitate to ask us for advice. If the clients would like graphics in the performance it is advisable to use LED screens of a minimum of 3.5 metres of width and 2.4 metres height. Team Tron could also work with LCD screens, with back or front projection. The minimum stage measurements are 4 metres wide and 2.5 metres deep, but these measures get dictated by the number of performers. We are all looking for something new and exciting in the corporate world – and this is it! Check them out as they do provide the wow factor for your event. You guys did a great job and everyone was very happy. Always good to work with you and we will yell the next time we need something fantastic like this. It was a great pleasure having you in kuwait with all your amazing team! Your show was wonderful and the client was very happy in everything.Thank you again for all the efforts you made to give us an INOLVIDABLE show!!! Looking forward to working with you again soon in Kuwait. This is fantastic! Many thanks and thank you and your team again for opening the event in such a powerful and seamless way. It was great working with you and we are incredibly happy with the result. Really enjoyed working with you guys and the show was really effective. Now that we have done it once, we will look for another opportunity of working together soon. On behalf of the service plan team I want to thank you and your team for the professional preparation and the amazing show you delivered on Friday night. The client was way more than happy. The event was a success. Everyone is happy. I’m glad that I met you and it was certainly a pleasure working with you and your team. Was so lovely to work with you and your team. You were appreciative of the tight space we had and understanding that it was quite hectic the whole night which made it a pleasure to work with you. The guest loved it.